My Wedding on a Budget! Weddings can be really expensive and the thought of spending thousands and thousands of pounds on one day sent me into a mild panic. Luckily, I found a few ways to save those pennies that I thought you may find useful when planning your wedding. My biggest outlay of cash for the wedding was for the venue, food and drinks. When I began looking for the ideal place the first mistake I made was searching online for ‘wedding venues’. Everything I found was at least £1,500 just to hire a room for the wedding breakfast. I started to search for barns and hotels in Wiltshire, England, instead and stumbled across Rudloe Hall Hotel, near Corsham. It had just been acquired by Marco Pierre White but no changes had been made to the building, grounds and general running of the hotel. After deciding that it met my needs, I decided to book and agree as much as possible in terms of fees, overnight accommodation, menu and drinks. I knew that as soon as the new owner began work on the venue that the price would double, if not treble, as he has a very good reputation. I inquired about what renovation work would take place, when and if it would affect me between the time of the booking and the date of the wedding. My tip: Don’t choose the obvious and popular locations with rigid wedding packages. Be clear about what you would like and agree, in writing, anything you decide in terms of price, food, drink and decor etc. 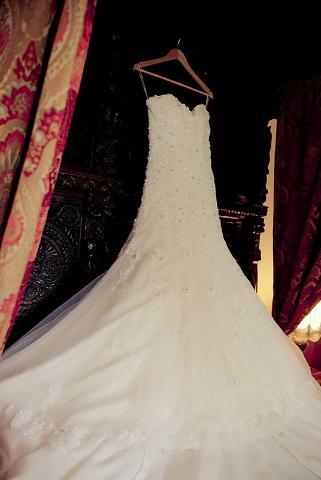 I bought my bridal dress from a shop in Bath, that was discontinuing a range of Maggie Sottero gowns. For this reason, it was the current season but 50 per cent off. I did have to hunt around and try on a dozen or so dresses all over Southern England before I found something inexpensive, modern and the style I liked but it was worth it in the end. The gown was a size 14 and needed to be altered to an 8/10 but as I’m only 5’4″ I would have budgeted for this expense anyway. The dress had a lace-up back, which I’m not a fan of so I asked the lady recommended by the store manager to remove it and add a zip. Luckily, once removed the dress fit perfectly and did not require any altering. The bodice had a beautiful lace overlay and intricate beading hand sewn on and would have taken hours to unpick so thankfully this was all avoided. My tip: Spend a bit of time talking to the store manager about the type of dress you would like and what is in or slightly above your budget. Ask about any upcoming promotions they may be planning so that you can buy new season at a reduced rate. If you like a dress but it is discontinued like mine was, speak to the store owner about any alterations that need to be made to see if it is possible for your shape, size and budget before you commit to buying. The venue I chose for the wedding breakfast would have charged up to £20 extra per person for the little extras like table centre pieces, chair covers and coloured linen etc. For our 80 guests this would have added £1600 to our total spend. For me, this was a ridiculous amount of money for something that many people probably won’t notice or think too much of. Opting for a basic linen package and deciding that the gold chairs were attractive enough uncovered, I thought I would source my own centre pieces. 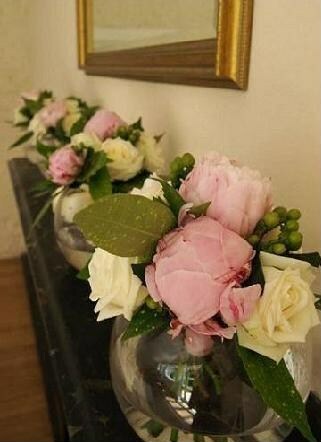 I was obsessed with Pinterest and finding unique and creative ideas that fit in with the beach theme, however, buying or hiring vases with the little decorative pieces, sand, shells and flowers would have cost a small fortune and involved the hassle of selling on eBay or Gumtree afterwards. I decided to forgo the beach theme for this one particular detail and instead, reused my bridal bouquet and those of the bridesmaids by placing them in to a fishbowl vase. I had three bridesmaids and would need four extra floral bunches in addition to mine. These ‘spare centre pieces’ also functioned as decorations around the fireplace in the hall where our wedding ceremony took place (pictured above). The florist kindly lent me the vases free of charge for the occasion. My tip: Re-use and borrow where you can. If there is something you don’t really need, like chair covers, go without. Every table doesn’t need to be identical to be attractive. Mismatched vases, stacked books, a trio of candles or tealight lanterns as a centre piece can create a cute rustic vibe at a wedding breakfast. For the evening reception, I thought it would be nice for the bridal party and guests to wear flip flops after a long day in heels and to dance the night away! I found these floral flip flops in Primark for £1.50 per pair and bought a few with cute designs which I placed in a basket for the guests who forgot to bring theirs. I also saved on the bridesmaids’ shoes and dresses by shopping around online and by talking to the managers a few High St stores. I managed to save 25 per cent on the dresses and found shoes for the daytime online. They were £30 each. My tip: Look for shoes and dresses in High Street fashion retailers. Anything specially made for bridesmaids was often double the price of a party dress. Search by colour and material and purchase during promotions if possible. If time is short, ask a manager for a discount if you are buying several items in one go. As I mentioned in my Valentine’s Throwback Thursday post, Andy and I made a lot of the little extras for our special day. 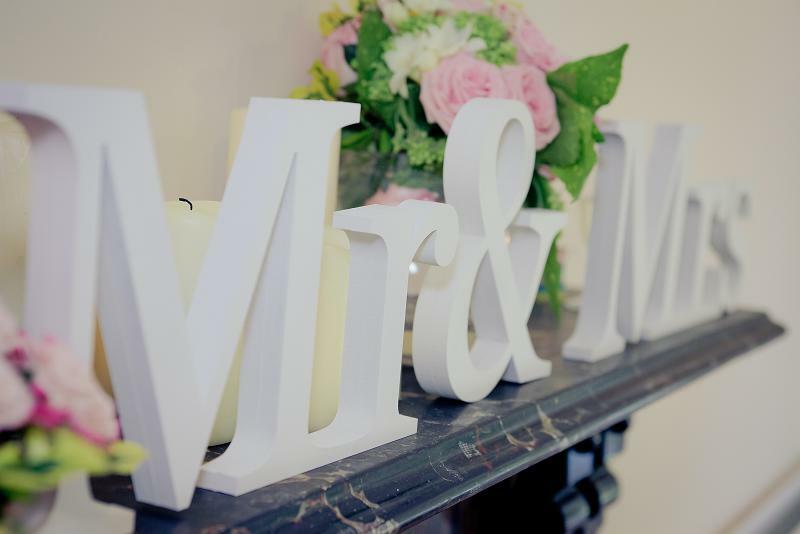 From ‘Mr & Mrs‘ decorative wooden signs to the wedding favours (which doubled up as place settings), we saved a lot on the bits and bobs that can top up your outgoings. In retrospect, I probably wouldn’t recommend making favours like this as not only was it time consuming but I had to leave it until the last minute so the sherbet wouldn’t melt and set. It was a big hit with the guests though, especially the children! We made the invitations ourselves with a pack of DIY pre-creased cards and envelopes from WHSmith. My husband used a laser cutter to cut out two interlocking hearts and embossed our names and the date below. I bought some pink coloured paper, printed out the text inside and used spray mount to attach. We saved about £75. My tip: If you aren’t good at crafts, look for things that you can assemble easily like ribbons, jewels and hearts etc. Colourful paper bags filled with sweets and sealed with personalised stickers are inexpensive for a homemade wedding favour. Ask family to do hair and make up – My cousin did my make-up, he works for Shu Uemura and a local hairdresser was willing to come to the venue to do hair for me and my bridesmaids (this worked out cheaper for all of us than bridal hairstylists quoted for me alone, with travel expenses included). 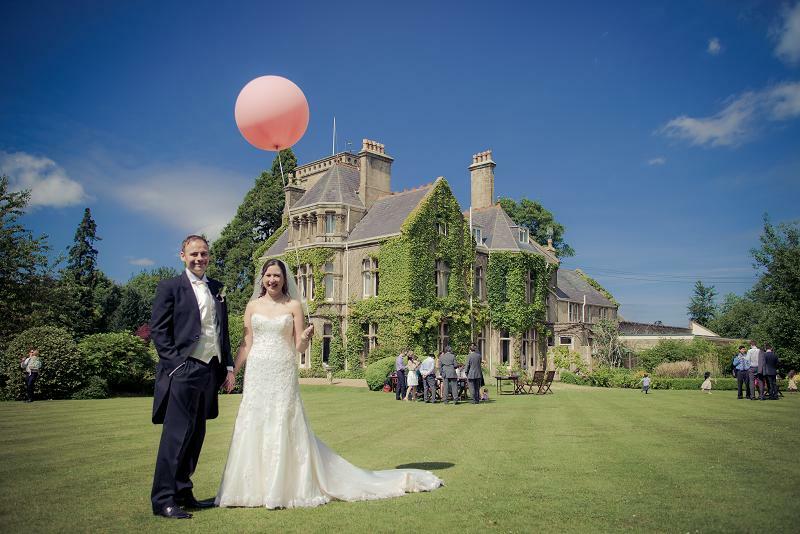 Search for a local photographer you like and ask if they can offer a one-off package – I saved £450 on photography. She was totally out of my budget but as I loved her style, I asked if she could create a package based on my needs for a price I could afford. Veer away from a three-course meal – this was something Andy particularly wanted but I would have been happy to have a ‘fish and chips in cones’ meal followed by desserts from a Mr Whippy Ice-cream van. If my guests were local to the area, I may have asked them to bring a dessert or buffet nibbles for the table rather than a gift. I have seen this so many times on Pinterest and I love it. In fact, two family friends bought or made our wedding cakes as a gift to us. In summary, I would say that it is definitely worth talking to friends, family and local businesses to find what you like for your big day at a reduced rate, or better yet for free! Be willing to compromise on certain things or spend a bit of time making, altering or hunting for a bargain. compatibility issues. 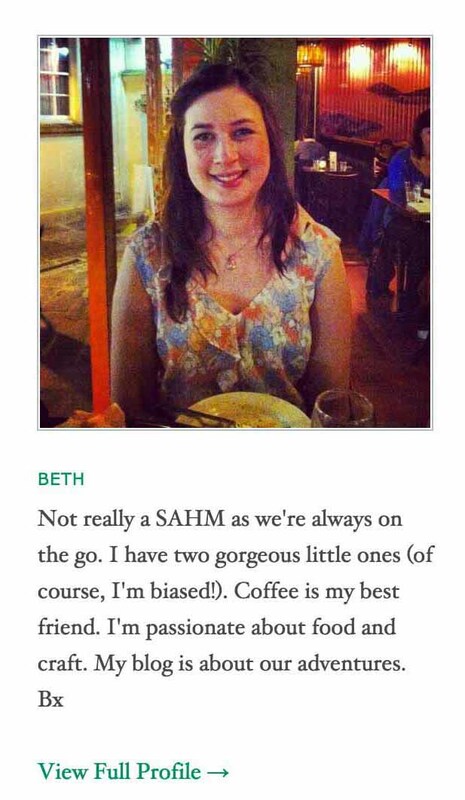 When I look at your blog site in Safari, it looks fine but when opening in Internet Explorer, it has some overlapping. Thanks, Carmela. I’ll have a look into this. Thank you. Very kind of you. It was one if the best days of my life. The two of you look so happy on your wedding day! Both of you must have put in a lot of hard work to plan the wedding and it all paid off on the big day 🙂 Very creative ideas on how to organise a wedding on a budget. The sherbet one especially – so many different colours in the tiny bottle! Thank you, Mabel. It was a great day and luckily for us it was the best day of the year in terms of weather too. 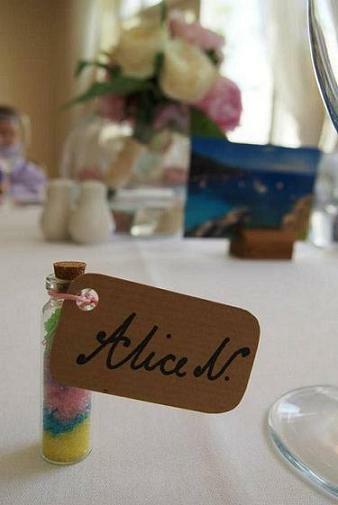 The sherbet took so long to fill into the bottles but to see the guests enjoy it was worth it.